Tomorrow, KDE release team is going to announce the new KDE 4.7.1. I will post a nice article about my Slackware packages then (they are ready and I am running them on this laptop successfully) but I know that there are some of you who still stick to KDE 3 for a specific reason: Quanta Plus. The Quanta Plus developers did not port their Web Development program to Qt4… and when KDE 4 was initially released basically that was the end of it. But to my surprise, these guys have been working on a Qt4 port for a while now, re-creating it as a plugin to kdevelop4. I thought what the heck, my KDE 4.7 is bleeding edge anyway, so I created package updates for kdevelop and kdevplatform (quanta needed the most recent source code found in their KDE git repositories) and then built a Quanta Plus package for you. I never used Quanta Plus so I have no idea if this program is at all functional but it starts, it looks nice and you can leave your remarks here in the comments section of the blog post after I release it together with the rest of KDE 4.7.1. Posted: 6 September, 2011 in Slackware, Software. 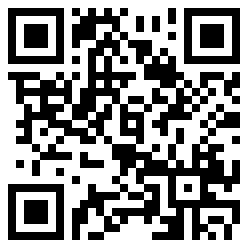 I did use Quanta, and liked it, because it was easy to use. It had just the functionality I needed at that time, the GUI was intuitive. However, in terms of stability it didn’t score high, not even average. It crashed a lot, to be honest. Nevertheless, I used it, because there were no real alternatives. Can’t speak for the new version, obviously, but I hope the new incarnation is much more robust. Anyway, it’s good that it’s back again. Yes I saw those meeting minutes, but quanta as a kdevelop plugin should be viable. And it is actively worked on. It starts as if it is a standalone application. Let’s see what the users have to tell about it once I have the packages out. Seems pointless since the patch says. I interpreted “too bad the patch is not included in the 4.7.1 release”, but can be I got it wrong. The patch is not included in KDE 4.7.1 SOURCES. That does not imply that it is forbidden to apply the patch to my PACKAGES. Well i guess i got that wrong. Unfortunately kdevelop now comes without translations. Is there anything one can do about this? This is great news. I have multiple websites developed with quanta and I have had to keep old KDE3 version running, just for running quanta,worrying that the project might be dead. I hope this new KDE4 version gets usable in the near future. I heavily need it! Quanta is dead. There are Bluefish which works great on KDE 4.7.3. Quanta may be dead, but it keeps working from the grave. I am using Quanta under KDE4/FreeBSD using the KDE 3.5 libraries to run Quanta. It is also running on Snow Leopard on the Macs and one brave souls is running it on the OSX 10.7 (fink distributions) without a lot of difficulty. It sure would be nice to have a native version on KDE 4. 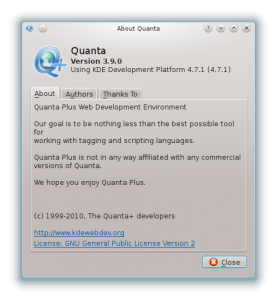 I added Quanta Plus a while back, but since then the developers have stripped the quanta source code from all its components and have added the functionality to kdevelop instead. Quanta’s source repository is nothing more than an empty skeleton at the moment so it will not come back into Slackware. I think this is finally dead since it no longer compiles against the new version of kdevplatform.